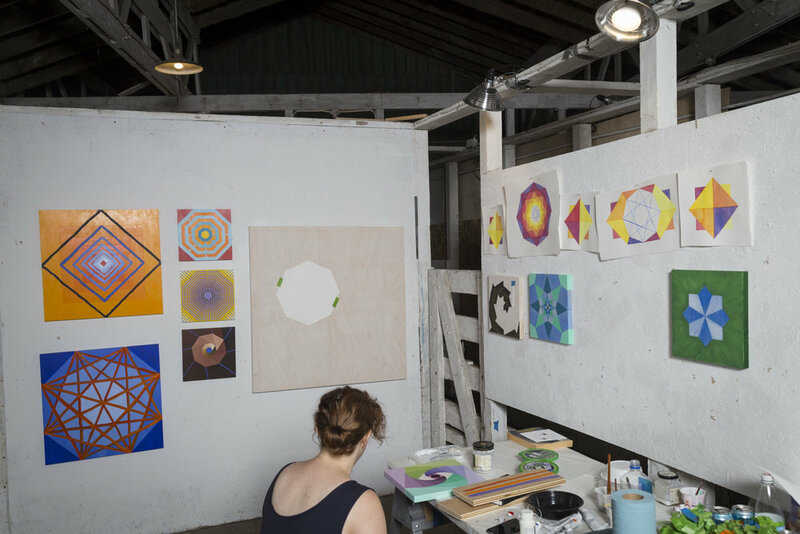 Amber Heaton collects materials and data about natural systems including patterns of light and time. She visually translates her findings into prints, drawings, installations, moving images, and artist’s books. Her work has been exhibited at Parrish Museum of Art, International Print Center New York, Highpoint Center for Printmaking, and other venues internationally. Heaton received her MFA from the Rhode Island School of Design in 2012, her BFA from the University of Utah in 2009, as well as a BUS degree in Human Diversity from the University of Utah in 1998. She was also awarded a Fulbright Fellowship in South Korea from 2001–2003. Heaton lives and works in Brooklyn, NY. You said that you wanted to try painting for the first time while you were here. Can you tell me what your work has involved previously, and how that process has changed or stayed the same as you’ve made this transition to painting in the last month? Most of my work up until now has been works on paper or installations where I use a lot of string to make three-dimensional drawings in space. In the past year I've also done wall paintings with latex paint, but that doesn't feel like painting. It’s “painting,” with quotation marks. It’s not like I'm painting a mural — I'm taping areas out and then just rolling it with latex paint. For me, all of that falls in the realm of drawing. The way I approach most of my work is with an experience that I’ve had in the natural world. Then I’ll take a set of data or parameters, and use algorithms to translate and abstract the feeling of that experience through a piece of art. That's the attempt that I’m continually making; when working in prints, drawings, or installations, I've always created a plan and then followed the plan to the end of its execution. But I have a show coming up in a gallery that's shaped like an elongated octagon. And I had been making this work that's based on how the polygons of the numbers one through ten express all of the building blocks of the underlying structures of nature. How crystals form, how plants form — polygons of the numbers one through 10 can be used to construct a lot of those microscopic structures if you break them down in a geometric sense. So since I had been doing that geometric base work before seeing the forefront of this gallery that looked like an octagon, I wanted to use that shape as a jumping-off point for all the works in the show. I wanted a chance to really dive into multiple octagonal designs: to play around with color, see what sense of the shapes I could get, and see how I could change and manipulate designs that are historically based on that shape. But if I tried to do that in print or in an even bigger installation, it would just take a lot more time. So for these I thought, “okay, I want to do this shape, but I'll just play around with what shapes and colors are going to come.” So it's been fun to be somewhat more spontaneous in terms of what colors I'm putting down and what the designs are. But one thing I've found myself thinking is that this would be even more fun if I didn't have this set of parameters. What's going to happen when I don't have this one thing that I need to get done for this deadline? What kind of stuff is going to come out when I'm playing around with painting where I don't have to just make octagons? Being at the residency has motivated to me to be more spontaneous. In some ways, I'm even more excited to see what I make after I'm gone from here. Do you think that whatever you're working on the future will still involve data sets and rule sets? Even if you, say, spontaneously begin a piece and then impose those parameters on it as it develops. Or do you think you want to explore not having those rule sets be the foundation at all? I feel like at this point I want to explore not having any parameters at all. Which I think will be really hard for me. But maybe those pieces will be less visually rigid than I've expressed them in the past. Because all my work, even though it's based on natural experiences, looks like formal geometric abstraction. Up to this point, it's been a little bit of a disconnect for me to say that my work’s about nature. Somebody will look at a piece and say, “no it’s not, what are you talking about?” The expectation when you see a work that looks geometric is that it's not about nature. Even if, for example, it's a drawing of all the natural light in Brooklyn for a year or something. It still looks very precise. In your pre-interview questionnaire, you had an interesting response to the questions about what song you can't get out of your head. You chose a Beethoven piece. Specifically, "Andante con moto": the second movement of Beethoven’s Concerto No. 4 in G Major for Piano and Orchestra. I’m curious about that. Because music — and classical music in particular — seems to be an art form where, despite its formal structure, it wouldn’t feel unnatural to say that a given piece was inspired by nature. Does that sound right? And can you say more about if and how music classical music plays into your work? Yeah, that's really interesting because it's a conversation that's come up multiple times. Since I use a lot of strings in three dimensions, in the past people have said “oh, you should make big instruments.” But here in Wassaic, people have told me that the works themselves are really musical. And I haven't really thought about it like that before. But I was a DJ for a long time and I’ve studied this Korean drum called the Janggu. So percussion has always been part of how my brain thinks about things, and I've been a great lover of classical music for a long time. The complexity that you get in classical music is slightly different than when you get in pop music (not to say that pop music isn't complex and very profound sometimes). It’s interesting, too, to think about how different people can use the same system of musical notation, but be spontaneous and make something totally different than another person. In terms of how I work visually, I’m using this set of ideas that happened rhythmically over a space. And that's very much in tune with me being interested in percussion. I don't think that that's necessarily specific to classical music, but the level of complexity that you can get in classical music is something that I would strive for visually. Even if a lot of things that I'm making are more minimal and symbolic, the goal would be to make something that was as complex as that piece of Beethoven. I never really take a specific piece of music and think “oh, I want to make a work about that.” But within jazz or the kind of drumming that I studied, there are basic rhythms upon which each individual musician is improvising, even if everyone’s playing as a big troupe of players. That kind of thinking has always been in my brain creatively, since I was a kid. That Beethoven piece is a piano concerto, so there’s the piano and a there’s a symphony, and they’re having a conversation with each other. And that particular movement has very much of a sense of a call and response. The piano will have a really soft part, and then the strings will have this very heavy presence. So in my head, I'm always thinking about how the two patterns of those instruments are interacting. About how to create a conversation like that in a work of art by overlaying patterns and colors and tones and intensity. Or if I was making a Beethoven music video: what would that look like? What colors would those sounds be? How would those colors interact? Do you feel like the experiences from which you take inspiration are mostly visual, with some occasional musical inspiration for certain rule sets or parameters? Or is there more of a range? That often happens in nature, but, of course, it can be a film or that Beethoven piece. If I put the Beethoven on while I’m just, producing in the studio, as soon as that piece comes on, I stop. It's an intense emotional response.